The Magic Carpet: Oriental Rugs - Why Own an Oriental Rug? 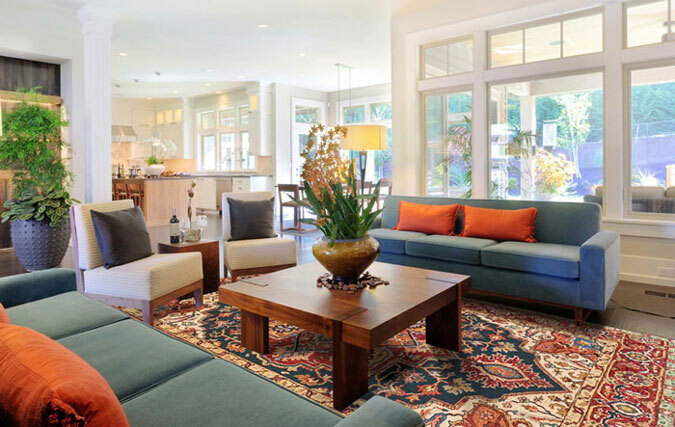 Oriental Rugs » Why Own an Oriental Rug? Any ordinary room can be instantly transformed by adding a beautiful Oriental rug. The right rug, with a harmonious balance of warmth, color and design can enrich and enliven any environment. For centuries hand-knotted rugs have been used for comfort and beauty, as well as valued for their durability. Today they endure as a prized component of our interior environment. A beautiful Barakat Cultural Survival rug enhances a home. Recently, Oriental rug producing regions have endured political challenges and economic changes that are radically impacting the industry, threatening the tradition of hand-knotted rug production more than ever before. With machine-made, inferior products being mass-produced, authentic Oriental rug weaving is on a steep decline. To help prevent losing the tradition entirely, Cultural Survival projects have been established by a few dedicated individuals to support these weaving communities, and a small number of extraordinary rugs are continuing to be produced. These remarkable hand-knotted rugs, using hand-carded and hand-spun wool, dyed from vegetable sources, are available today at The Magic Carpet, one of only a handful of stores worldwide offering them. Cultural Survival projects supported by The Magic Carpet are dedicated to fair trade practices with no child labor. A percent of profits from every rug sold is used to help weaving communities build and maintain schools, as well as provide support for literacy and environmental programs. These rugs are made using wool from sustainable sheep herds and dyed with replenishable plant materials. In an age where we are increasingly aware of our footprint and impact, it’s rewarding to know that the purchase of an Oriental rug is a truly green investment. Owning a Cultural Survival rug, while supporting the weavers and protecting the environment, is a win-win situation for everyone. Considering the qualities of a hand-knotted Oriental rug, the reason for owning one can certainly be monetary investment, but usually the value becomes an emotional one, as many rugs become family heirlooms handed down from generation to generation. Oriental rugs are one-of-a-kind works of art that combine a genius of design and symbolism with extraordinary craftsmanship. With the time, artistry and skill that goes into creating a high quality rug, it is remarkable that they are still so relatively inexpensive; a fine, hand knotted 8’ x 10’ rug can take three weavers six months to complete and require nearly nine miles of yarn. It takes years for weavers to obtain the skills and knowledge needed; these are family and cultural traditions passed down from parent to child through the ages. The designs contain centuries of history. The Magic Carpet specializes in hand-made Cultural Survival, tribal and classical rugs and offers a breathtaking collection of over 1,000 pieces. With 34 years of experience, the Magic Carpet is delighted to share its expertise with you, helping you select colors, designs and rug styles that will enhance your home or office. The Magic Carpet also offers expert washing and repair services, certified appraisals, home trial, delivery and placement services. We invite you to come and enjoy our wonderful collection in our shop or view our entire inventory online at www.themagiccarpet.biz. On our web site you can also find all of our monthly educational articles on the extraordinary art and history embodied by Oriental rugs. For any questions about Oriental rugs, please contact us at 530-265-9229 or at . We are located at 408 Broad Street (The New York Hotel) in Nevada City.